Such was the case this past weekend when we checked GMail and found 73 Forgotten Hits related mails there ... stuff that was once quite timely to a particular feature we had going on when they first arrived but otherwise totally out of date and irrelevant as to the topics we're covering today. Hey, we LOVE to hear from you ... what has ALWAYS made Forgotten Hits work is the interactive dialog amongst our readers ... but if you're not sending your comments to the right email addresses, you may as well not send them at all ... as there truly is no way of knowing when they might finally be seen. So PLEASE update your address books to show ONLY forgottenhits@aol.com and kk@forgottenhits.com as the two, sure-fire, most viable addresses to reach us ... or risk falling between the cracks for months on end! Meanwhile, we'll sort thru this "new" (very old!) mail and see if any of it is salvageable and relatable to what we're currently doing today. Thanks, Folks!!! Here is some of the material we found sitting in the mailbox ... in some cases for MONTHS!!! We'll follow up some of this "old news" with some of your most recent contributions. Wanted to make sure you received this. The label asked me to write and prepare a tribute. It also has quotes from PF's own voice culled from a 1987 radio interview. Might be of interest to your readers. Singer / songwriter P.F. Sloan passed away on the evening of Nov. 15, at his home in Los Angeles. Sloan had been diagnosed with pancreatic cancer several weeks before and was fighting it valiantly. P.F Sloan was a key element of the music that became the sound of the Sunset Strip. His tunes were covered by Barry McGuire, The Grass Roots, Herman’s Hermits and The Turtles. He was a prodigy, signing his first record deal with Aladdin Records when he was 13. P.F. Sloan, born Philip Gary Schlein, attended Fairfax High in Los Angeles, with future vocalist and record producer, Izzy Chait, and later teamed with songwriter Steven Barry Lipkin, later known as Steve Barri. Sloan’s recently published his memoirs, What's Exactly The Matter With Me? with S.E. Feinberg, and his latest album, My Beethoven, was released on the MsMusic productions label. “I was a fan of The Fantastic Baggies, his music from the Eve Of Destruction LP by Barry McGuire and, of course, his ‘Secret Agent Man,’” offers Carol Schofield, owner of the label who issued My Beethoven. 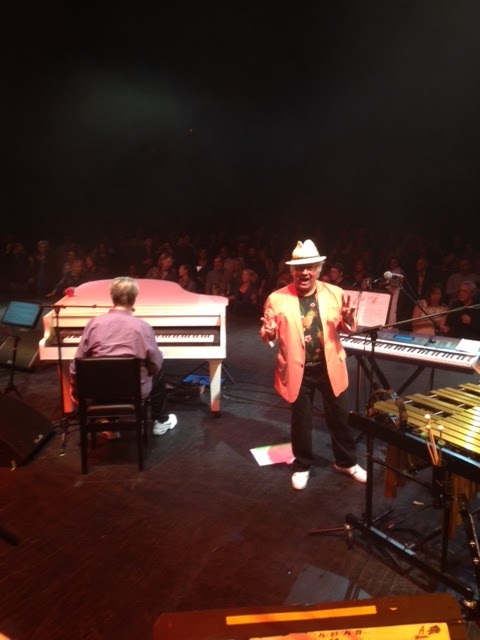 “My friend, Stephen Kalinich, who has recorded for me, introduced Phil and I. We breezed smoothly through the contract and deal. Other music and record business veterans also offer their reflections on one of the world’s shape-shifting songwriters. Gary Stewart, Former VP of A&R for Rhino Records: “I was fortunate enough to work with P.F. Sloan in 1985 when I had the privilege to work on a ‘Best Of’ — my first ever Rhino vanity project (our inside term for things driven solely from personal passions). It was my reward for the success we achieved after my signing of the Beat Farmers. I wanted to reclaim the best of his two Dunhill albums from the rarified circles of record collectors and music snobs (at the time I was both). “I just couldn't accept the fact that folk rock masterpieces like ‘Sins of a Family’ and ‘From A Distance’ weren't well known classics but distant obscurities. In the world I want to live in, most of the tracks on those first two albums would be heavily covered and about half dozen belonged on the charts at the time. We’re not talking about a Captain Beefheart / Rocky Erickson type cult artist but somebody who wrote melodic accessible songs knee-deep in the zeitgeist of the times. As a teenager, Rodney Bingenheimer, KROQ-DM DJ, first met Sloan in Hollywood around Sunset Strip venues like The Galaxy and the Trip, as well as the restaurants Ben Frank’s and Canter’s Delicatessen. “He was a nice guy and always at the recording sessions when his songs were done by the Grass Roots and Herman’s Hermits. He always played on many recordings by the Mamas and the Papas and Sonny & Cher. “P.F. Sloan wrote anthems like ‘Where Were You When I Needed You.’ Even this decade on my Rodney on the ROQ program, I play his ‘Halloween Mary’ — both the original and the re-make.” Stephen John Kalinich, songwriter: “I love P.F. SLOAN. He inspired me, touched my soul — made me be a better person and poet. He traveled with me to India with Jon Tiven. He got me out of hibernation. I love the songs I created with him but above all he loved people and wanted to make difference in the world and to help others in need. At 19 he wrote those words and melodies. He influenced me as much as anyone ever did in music. I miss him in the flesh and he will always be in my heart. “Around 1985, I helped locate P.F. Sloan from semi-obscurity via a music publishing connection at my former employer, MCA Records. I subsequently arranged for him to perform after a long hiatus at one of my Be Bop Records music and spoken word events in Reseda, California. "I wrote hit records and that was working against me,” Sloan recalled to host Steffens on his revealing radio interview. “It really was. It made me feel isolated, but I met a lot of very nice people who made things easier for me. Bob Dylan, Mick Jagger, Paul McCartney. I was very honored to have been asked by Bob Dylan to listen to an acetate pressing of his Highway 61 Revisited album just after he'd come out of the studio." Speaking of Billy Hinsche, we were listening to the new "Beach Boys Party!" outtakes CD and found something interesting ... "The Boys" fooling around in the studio playing a little snippet of Dino, Desi and Billy's recent hit "I'm A Fool" (segued into a couple of other songs with similar chord changes.) I couldn't help but wonder if he even knew about this! Yes, I heard it - awesome - thrilled! Let me add a slightly different view on "Susan" by The Buckinghams. It has been confirmed in several interviews that the song was "originally" recorded without the train wreck psychedelic sound effects. The producer edited that portion in after the recording session. The band members have stated they never heard that version until they were back out on the road. Some stations had problems with the commercially issued version so Columbia issued a promo copy with the commercial version on one side, and what is usually listed as a "radio edit" which I contend is probably the actual original recording without the insert. Why reissue labels keep trying to edit the stereo version to try to simulate the original makes no sense to me ... why not issue the original in mono? It is compressed to fit in with AM radio stations of the day and would just jump out the radio at you. In addition to the promo disk, Columbia also mistakenly issued it on a Hall of Fame release. It’s great that Kyle Vincent got back to you. He truly is one of the best kept secrets in pop music. I first heard him with Wake Me Up (When the World’s Worth Waking Up For), a power pop classic, and have bought all his albums ever since. Check out his vocals on Whatever Happened to Fun when he was with Candy and as a solo artist on Arianne. Truly awesome! Nice piece on "Rubber Soul". I want to add that a superior sounding remixed version of the song "Think For Yourself" is on the Beatles "Yellow Submarine Songtrack" CD. Maybe you'll like it more in this remixed version (lol)! The 1999 CD contains all of the Beatles 15 songs that appeared in the film, fully remixed, like the recently released Beatles "1+" CD. I think a lot of your readers may not be aware of this "Yellow Sub" CD. You'll love the remixed "Hey Bulldog" where Lennon's vocals are a lot more prominent in the mix, making the song a lot more powerful. "Nowhere Man" is also on the CD, as well. Actually, I've always liked "Think For Yourself". In fact, there is a very short snippet used in the film of John and Paul working out their background harmonies prior to recording the final track. I enjoyed your Rubber Soul coverage so much I dug the CD out and plopped it in the car player - and I haven't taken it out since! I've already listened to it three times this weekend alone! What a great LP. Thanks for reminding me just how good this really is. I've really enjoyed all the info on The Beatles' "Rubber Soul" album, especially comments by individual members of the band. When I read about "Norwegian Wood", I couldn't help but think about a cover by Sergio Mendes and Brasill '66. I love it. It took the song in another direction, with it's arrangement and percussion. I used to play along with it on the drums. Sergio's recording really needs to be heard on a good stereo! Here's Lee Loughnane being interviewed on Chicago's induction into The Rock And Roll Hall Of Fame. I wish Freddy Cannon well on his birthday! Did you know he was in one of the first "supergroups"? Here is a video of Freddy backed by The Belmonts. Would have been cool to see these guys together! I only see one original Belmonts member here. Fred Milano is on the right. It's also nice to see Mike Douglas again. 76?? Try 79! He was 3 and a half when the 1940 census was taken. A news article on his website from 2007 claimed he was 66 and married to his wife for 52 years at that point. He married her at 14? Not likely! He probably had to shave 4 years off his age in the 50's like all other singers of the era did, he probably thinks that's his real age now ... he will be 80 next year. FH Reader Tom Cuddy informs us that Steve Perry, the legendary former lead singer of Journey, is putting the finishing touches on his new LP ... his first since 1994! STEVE PERRY: New Album Next Year? The former Journey singer hopes to finish his new disc early next year. Steve Perry has been recording a new album, and he hopes to finish it early next year. The former Journey singer tells Los Angeles radio station KSWD, "I finally went into the studio in March, and I've been in there ever since, just trying to finish this record ... I certainly am looking forward to finishing it ... I wanna get it done probably in the early part of this coming year." Perry's last album was 1994's For the Love of Strange Medicine. Bobby Darin recorded his version of 'Mack The Knife' on 12/19/1958. Here he is performing it live in 1972. And here's Lou Costello (of Abbott and Costello) singing 'White Christmas'. I guess Lou can be serious. I didn't think it was possible. Concerning your recent post on the upcoming Bruce Springsteen tour; He is my favorite current musical artist (the Beatles would be my favorite all time). I have seen him probably close to 15 times since 1978, most recently May 1, 2014, here in Tampa, Florida. Since the first time I saw Bruce, I have not missed a tour if he showed up anywhere in the state of Florida and this time will be no exception. As you can see by the touring schedule he is playing in Sunrise, Florida, on February 16 and, yes, I have my tickets. It's only about four hours from my house, but no problem, I have actually driven as far as Atlanta (about 8 hours). Yes, his show is that good. I have probably seen close to 1,000 concerts since my very first in 1969 and if I were to compile a Top Ten favorites he would probably hold at least five spots. Yes, again he is that good!! If you have any chance to see his show in Chicago, do not hesitate, GO! The fact that he is playing The River, one of my favorite Bruce albums makes it all that much better. I will send in a review of the show and I can tell you now, it will be a positive one. By the way in case you were wondering, my vary first concert in the fall of 1969 was Blood, Sweat And Tears. I was 14 at that time and it made a huge impression on me and I haven't stop going to shows since. In fact to somewhat honor that first show, the trivia time I play on two nights a week is named Blood, Sweat And Beers. I've talked before about seeing Blood, Sweat and Tears for my birthday in 1971. Their opening act that night was Linda Ronstadt, just starting to come into her own but still a few years away from her big breakthrough with "You're No Good". During the performance, she introduced a couple of members of her back-up band who she told us would soon be leaving her to start their own band. In fact, she said, they just signed a record deal and were going to perform a couple of songs from their first LP. Dion (DiMucci), the legendary New York rock ’n’ roller, will appear at SXSW for the very first time in a program set for Thursday, March 17, at 3:30 PM titled “A Conversation With Dion: Rock’s Enduring Voice." Dion, who was inducted into the Rock and Roll Hall of Fame by Lou Reed in 1989, will discuss aspects of his career, his creative process and his place in music history as we all as his latest project, New York Is my Home, an album set for release on February 12, with Richard Gotteher. Gottehrer is a veteran music industry figure who co-founded The Orchard, the music and media company that is the largest supplier of digital music in the world. He wrote such classic hits as "My Boyfriend's Back" and "I Want Candy" and was part of the neo-punk group The Strangeloves. He co-founded Sire Records with Seymour Stein in 1966 and went on to produce albums by Blondie, The Go-Go’s and Richard Hell, among others. Gottehrer’s Instant Records is the label behind Dion’s new album and has already released its title track, a duet with Paul Simon. New York Is My Home was produced by Jimmy Vivino, the musical mastermind who is seen nightly leading The Basic Cable Band on Conan. He will be on hand at the SXSW program and is expected to join, as Dion put it, in “maybe punctuating some of the stories with a song or two or three.” An official SXSW evening performance event in Austin by Dion with Vivino’s participation is planned; information about that is forthcoming. This one might appeal to some of the car buffs on our list ... can you name which car these dashboards belong to??? FUN! I DIDN'T DO VERY GOOD BUT I GOT THE LAST ONE RIGHT!!! This is tough!!! Also, after each answer you get an option to “Click to see car”, so you can see the actual car that goes with that dashboard. The calendar says another year is winding down ... how fast they go now ! The demise of the "Oldies Station" is almost complete, personally I have not complained of constant Christmas Songs playing 24/7 over the airways as I had in the past, but only because I no longer listen to broadcast radio rather I only listen to CD's I have burned or playlists from my iPpod or iPhone. I hardly ever listen to the radio any longer (I miss it). Surely though there are plenty of Christmas songs to enjoy during Christmas Week, so where is the readers favorite's list? Especially the creative non-traditional ones? i.e. Grandma Got Run Over by a Reindeer, I Saw Mommy Kissing Santa Claus, and the off the wall offerings from Dr. Demento. I want to escape the gaudy commercialism Christmas has become known as and have some fun by enjoying all the great Christmas music of my life ...what I am trying to say is "I Want A Hippopotamus For Christmas"!!! Merry Christmas to all The Forgotten Hits readers, and all the Oldies Music / Music Oldies chat room members from AOL, and thanks for keeping our marvelous music alive. We've kind of shied away from the heavy-handed Christmas stuff the past couple of years ... we did our Twelve Days Of Christmas for so many years that I think the novelty kind of wore off on me. (Typically this featured NEW Christmas music our readers might not have otherwise been aware of rather than personal favorites) ... but the pure saturation of Christmas music on ALL of the radio channels this year has left me worn out well before the holidays ever hit. The ad that Shelley Tufano sent in a few days ago containing some 14 tunes with coffee in the title, got me to thinking. That's a beverage I haven't drank in years, so I think I'll go into my kitchen and pour me ANOTHER CUP OF COFFEE while listening to a record by Brook Benton. Afterwards, if I feel like it and I'm sure I will, I may do a little dance known as THE COFFEE GRIND while listening to a Hank Ballard record. Some of your readers may prefer the slang term for coffee and that would be JAVA. I understand that was one of Al Hirt's favorite liquids. (There was another particular song I cannot remember right now. I don't know about you, but it bugs me when I know the name of a song, artist or group, etc. but can't remember the name.) Well, just now I remembered it. Kent, I don't know how familiar you are with the song I'LL JUST HAVE ANOTHER CUP OF COFFEE, but singer Claude Gray recorded it in 1961 on Mercury Records. It was considered to be a cross over record. That is the one I couldn't remember. I bought the 45 of "The Mexican Hat Rock." I didn't realize what an important part of Philadelphia Music the late Dave Appell was till I read this article. The Experience Hendrix Tour, a multi-artist celebration that is set to return in February and March of 2016, has just announced the inclusion of more outstanding guest musicians who are to play select dates. These special concert performances involve artists joining together to celebrate the musical genius of Jimi Hendrix. This next edition of the Experience Hendrix Tour will encompass twenty seven performances this coming February and March, stopping in more than two dozen cities, with focus on the east coast, midwest and southern states. At various points throughout the tour, artists such as Keb’ Mo’, Barbara Lynn, Doyle Bramhall II, Ana Popovic, Jon Butcher, Quinn Sullivan, Joanne Shaw Taylor, and Slide Brothers members Calvin Cooke and Chuck Campbell will join Experience Hendrix Tour mainstays, creating a unique atmosphere where no two performances will be alike. Those musicians who were already announced include blues legend Buddy Guy, Black Label Society and former Ozzy Osbourne guitarist Zakk Wylde, as well as Jonny Lang, Kenny Wayne Shepherd, Eric Johnson, Dweezil Zappa, Jimi Hendrix Experience / Band of Gypsys bassist Billy Cox and many others. Three-time Grammy-winning blues singer / guitarist Keb’ Mo’ will help kick off the Experience Hendrix Tour by performing at the Florida and Georgia dates. The Compton, CA-born musician can be considered a guardian of the Delta blues sound, but has always added his own style to traditional forms. Barbara Lynn, a left-handed guitarist / singer / songwriter, like Jimi Hendrix himself, and also born the same year as Jimi, is best known for her 1962 hit “You’ll Lose a Good Thing,” as well as “Oh, Baby (We Got a Good Thing Going),” covered early on by the Rolling Stones. The east Texas native will make her sole Experience Hendrix Tour appearance on March 5 at the Bayou Music Center in Houston. Another left-handed Texas guitarist / singer who will be participating in the tour is Doyle Bramhall II. A solo artist who was also Eric Clapton’s guitarist for many years, his résumé includes collaborations with B.B. King, Elton John, Sheryl Crow and many others. Bramhall II will be playing every Texas date as well as New Orleans, St. Louis, Milwaukee, Detroit and Chicago (March 3-12). Ana Popovic and Joanne Shaw Taylor have a lot in common. They are both up-and-coming blues singer / guitarists from Europe (the former from Serbia, the latter from England). Taylor, who was discovered at the age of 16 by Dave Stewart of the Eurythmics, is a winner of multiple British Blues Awards, including Best Female Vocalist (2010, 2011) and Songwriter of the Year (2011). New to the tour, Taylor will be performing at the Jacksonville and Atlanta dates. Popovic, now a resident of Memphis, has been on a few Experience Hendrix Tours in the past, including 2014, where she dazzled audiences with her rendition of “Can You See Me.” She can be seen in St. Louis, Milwaukee, Detroit, Chicago and Cincinnati this time around. Rock and blues guitar prodigy Quinn Sullivan first gained national attention when he appeared on The Ellen DeGeneres Show at the age of six. Soon after, Buddy Guy took Sullivan under his wing, and now at 16, with two albums and multiple tours under his belt, the singer / axeman has joined the ranks of fellow Experience Hendrix Tour musicians Jonny Lang and Kenny Wayne Shepherd, who also began their careers at a very young age. Sullivan will play the last three dates of the Tour - two in his native Massachusetts, and one in New Hampshire. Jon Butcher’s musical career goes back to the 1970s, when his band Jon Butcher Axis opened for KISS among others. Having released several albums of his own, the guitarist often draws comparisons to Jimi Hendrix, which makes him a natural fit for the Experience Hendrix Tour. Like Quinn Sullivan, Butcher will perform at the final three dates (March 23-25). Both Calvin Cooke and Chuck Campbell are known for being members of The Slide Brothers – a four-man steel guitar group that shifts seamlessly between gospel and secular blues music traditions. Cooke is hailed today as the most influential living pedal steel guitar master within the Sacred Steel tradition, and has been called “the B.B. King of gospel steel guitar.” His sole Experience Hendrix Tour appearance will be at the Fox Theater in Atlanta on Feb 27. Campbell has been playing lap steel guitar since the age of twelve and is renowned for his innovative approach to the instrument. He will play the Experience Hendrix Tour dates in Northfield, OH, Syracuse, NY Wallingford, CT and Brooklyn, NY (March 15-18). Jimi Hendrix was a pioneer in both rock and blues, and expanded the possibilities of what could be achieved with the electric guitar, forever altering the course of music history. Likewise, the Experience Hendrix Tour is developing a rich history of its own. By 2004, the first Experience Hendrix Tour came to fruition with a three-date string of shows on the west coast, starting in Hendrix’s hometown of Seattle. By 2008, the Experience Hendrix Tour had become a full-fledged, coast-to-coast expedition that continues to date, without showing any signs of slowing down Audiences are presented the opportunity to see great artists paying homage to Hendrix and collaborating with each other in ways they’d never do in their own live shows. More special guests to play the 2016 Experience Hendrix Tour will be added in the coming weeks. Please check jimihendrix.com and local listings for announcements. As in years past, Fender Music Instruments is the primary tour sponsor. Fender and Experience Hendrix L.L.C. have long enjoyed a successful relationship—an association that traces back to Hendrix transforming the Fender Stratocaster into the dominant instrument of rock and roll music. Marshall Amplifiers and Dunlop Manufacturing, whose gear is an integral part of the tour’s backline, also sponsor the Experience Hendrix Tour together with Axe Heaven IK Multimedia and Hal Leonard. The last was a hit, leading to the monthly ``Made In Chicago`` and two programs, with Seals & Crofts and the late Jim Croce, which went on the PBS network. The effort so impressed PBS affiliates that they placed the new show on their Top 10 list the following spring. It was a good time for the record business in Chicago, Erlich remembers, and ``a half-dozen local promotion guys really got behind the show.`` Gordon Lightfoot, Styx and Wilderness Road were among the performers on ``Made In Chicago.`` Its increasing prestige gave a quick start to its successor, ``SoundStage,`` in 1975. After I taped Jim Croce at Harper college in February, 1973, I went to WTTW (PBS) a couple of months later, to see him and Maury on "Made In Chicago". Almost 30 years later I was making a sales call at WTTW and I ran into an engineer at the station who worked at the concert. I asked him if he knew if the master was still around. Well it was and he made a copy of it and sent it to me. You can see me in the audience. I made a copy of the tape and sent it to Ingrid Croce. She had never seen the concert. Jim died about a month later. I was fortunate to have seen Jim Croce several times during his very brief but meteoric rise up the pop charts ... a more charming and likeable individual on stage I've never seen. Everywhere from the small Quite Knight in Chicago to 4th Row seats at Ravinia, shortly before his fatal plane crash, Croce ALWAYS put on an entertaining show. As an audience member, you just felt like you KNEW him ... he was able to convey a very personal, one-on-one relationship with each individual audience member ... a TRUE gift as a performer. I still miss him to this day and often wonder what other great stories he might have told us, had he been able to stick around long enough to do so. I've never tired of his music and it still brings a smile to my face every time I hear it. Just wanted to say thank you for mentioning the new Charity Cd, the Soldier, on your blog. I couldn't think of a more worthy cause than supporting our fearless men and women in the military. It seemed like the perfect time of year to do something for them. In regards to your statement about all the DJ's KOMA had on staff at the time, fifty years ago today, as I remember, Phil Robbins was in sales and news, Joseph Salvadori was in news, Fred Moore was the engineer, William Engler was in sales also. Now the reason their pictures were on the survey was that on weekends, they did air shifts. Paul Miller was the morning DJ and every weekday morning he would talk to the mayor of OKC on the phone to see what was happening in the city. Don MacGregor was PD at the time which, later on, Dale Wehba became PD. Bobby Davis and Kay did nights together with listeners calling in and asking Kay questions as I recall. You are right about the Juveniles being a local band. To be more specific, they were from Norman, Oklahoma. They were considered to be Norman's top band of all time. They were originally known as the Demons, later the Satans with eventually changing their name to the Juveniles. Their version of BO DIDDLEY was the biggest record they had here in the OKC area and made it into the top ten. (I am somewhat 100 percent sure the record itself made it to #1 in San Francisco. What top 40 station, I don't know.) They had a follow-up called BABY, BABY / I'VE SEARCHED, also on the Jerden record label. Incidentally, Jerden records was distributed nationally by ABC Paramount. The song that came in at #14. CHERRY PIE by Charles Christie was very, very big here in OKC. Now that I recall, it seems some people back then were saying that Charles Christie was related to Lou who was also related to Susan. Don't believe either is true though I don't know for sure. I lived just outside Oklahoma City for almost two years (August, 1961 - June, 1963) when my dad was stationed there. And ... that is where my record collection got started ... with a KOMA radio contest. My brother and I won a radio contest that gave us the TOP 40 hits from August / September 1962 ... such songs as Things, The Loco-Motion, Party Lights, Ahab The Arab. They had a weekly contest where you wrote in and guessed next week's TOP 10. If you were closest, you won the TOP 10. But...if you nailed the entire TOP 10 in order, you won the TOP 40. In the words of a song by a guy I have seen live 11 times - and who never had a hit in the USA - "From Little Things Big Things Grow". Here's the Paul Kelly song of that title, just for kicks. The KOMA chart from Oklahoma City was indeed a great chart and a monumental station throughout the entire nation, even world. Like WLS, KOMA's 50,000 watt signal caused people to write from the other side of the world at times when the "skip" was right in the winter. FH'er Larry Neal was a KOMA DJ playing these very hits on his oldies shows in the 90's. Thanks, Larry, for making me wake up at 6 AM on Saturdays just to hear obscure bands on your countdown of the KOMA charts like this one. OKC also had all the latest bands playing there because of KOMA's powerful influence on the record buyers. That's why you heard and SAW Dallas' "Five Americans," Iowa's "Steve Ellis," Kansas' "Chessmen", all with records on KOMA's chart here. At KOMA, they hobnobbed with the big boys and fans ate it up. The DJ's pictured here were of the top brand. "Charles Hanks" was actually "Chuck Dann" who gave us a tour of the station in 1963 and handed us each autographed 45s from the Sing-a-Long-Survey. Dale Wehba was my fave of the KOMA Good Guys. He gave Bobby Vee "Come Back When You Grow Up" in 1967 as a song to record. John Raven-Croft was a British bloke who was actually John Peel of Beatles sessions. What great time listening and as #3 says "and don't tell me I've nothin' to do." Lastly, Kent, the survey year of 1965 has come to an end and I want to thank everyone who looked at the charts I (and others) provided and hope youo all enjoyed them as much as I have for the last 50 years. Thank you so much for the copy of the 1969 Super Chart. Has any thought been given to create a Super Chart for the Top 100 Hits of 1969? I have another block of questions for you and your audience. Do you have any FOREIGN chart data for the hit Quentin's Theme by the Charles Randolph Grean Sounde from Dark Shadows? It made #9 for two weeks on the Super Charts in August, 1969. I know it was released in England, Australia, Canada and Sweden. Also, my source said it sold 750,000 copies by September, 1969 in the U.S. Any idea as to chart positions and / or sales figures for the record in other countries? I have been wondering about the above since 1969. Thanks for any help you can give me! 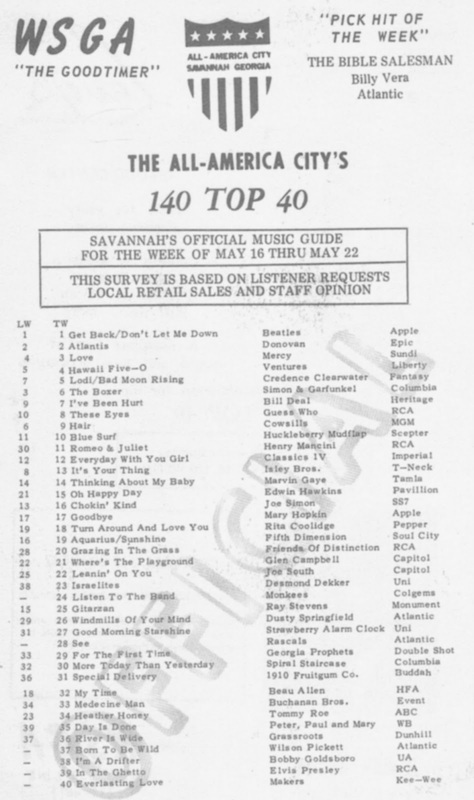 Does anybody know whether or not radio station WSGA in Savannah, Georgia, ever produced a TOP HITS of 1969 survey? Finally ... and I promise you this will be my last question for awhile ... I am just so excited about your FORGOTTEN HITS site! ... Do you or any of your readers have surveys to post from July or August of 1969 from WTTO? This is the Toledo, Ohio radio station which printed the WTTO FAMOUS 15 surveys at this time. P.S. I already checked the ARSA site with no luck. I am now a constant reader of your site. I immensely enjoy it. I'll bet there is no other site like it in the world. Hey, I have no problem with you asking more questions ... that's what we're all about. (And we've got a great resource of readers out there who quite often help us fill in the blanks!) I'm just glad that you're enjoying Forgotten Hits as much as you are ... please help to spread the word! I found one 1969 WSGA chart in my collection ... unfortunately it's from too early in the year to feature "Quentin's Theme" ... but I've posted it nonetheless. The only WTTO chart I have is from 1967 ... but we have a lot of readers in Ohio so maybe they can come up with something for us to run in a future issue of FH. Randy hasn't put together any year-end charts yet ... but I'm sure they're coming. I would LOVE to see the complete collection finally come to light this year in some form of publication. (We've been talking about doing this for YEARS now!!!) With the recent release of Joel Whitburn's Comparison Chart book, I think the time is right to FINALLY launch The Super Chart ... a compilation of the research of all three major trades, best representing the TRUE picture of what was popular across America at the time. (We would LOVE it if Joel himself would help us get this off the ground!) Stay tuned. You run a classy website, Kent!!! Frank Zappa and the Mothers of Invention “The Lost Broadcast: The Beat Club '68” Entire Performance To Be Released On DVD! London, UK – For the first time ever, Frank Zappa and the Mothers of Invention “The Lost Broadcast: The Beat Club '68” entire show will be released on DVD by Gonzo Multimedia in December 2015!This DVD contains a filmed rehearsal of Frank Zappa and the Mothers Of Invention at the legendary Beat Club in Bremen, Germany, on 6th October 1968. It was part of the band's second European tour, the first having occurred a year before, although this was their first visit to Germany. What can be observed during this event is a typical rehearsal scenario, where the band is eating, drinking, tuning up their instruments, enjoying some laughs, having cosmetics applied and gradually beginning to rehearse. The music is largely one long improvisatory continuous performance rather than a run-through of their greatest hits, but occasionally Zappa directs the band into the opening themes of some of his more well-known pieces. The ensemble performs interesting renditions of “King Kong”, “A Pound For A Brown On The Bus”, “Sleeping In A Jar” and “Uncle Meat”, all of which would be included on the “Uncle Meat” album, which had already been recorded but would not be released for another six months. Also played was an instrumental version of “Let's Make The Water Turn Black”, a version of “Prelude To The Afternoon Of A Sexually Aroused Gas Mask”, a stab at the “Prelude To Act 3 of Lohengrin” by Richard Wagner and a nod towards “Octandre” by Edgard Varese. The footage shows Frank's use his famous hand signals to great effect, conducting and controlling the direction of the music, instructing the musicians when to start, stop, punctuate, slow down, speed up, improvise, play in different time signatures etc. Ten days later, the Mothers of Invention were due to play at the Berlin Sportpalast. Prior to the show, Zappa was approached by students who, presumably still fired up by events the previous summer in Paris, where a revolution had almost taken place, asked him to declare his opposition to capitalism from the stage and, by extension, to further the cause of the armed and violent revolution that they believed was necessary to transform society. The students, wrong-footed by the band's long hair, freaky appearance and reputation, assumed that an anarchic look automatically foreshadowed an anarchic attitude. Zappa, far too intelligent a man to be swayed by their ill-conceived arguments, refused. The student leaders suggested that, in that case, Frank could lend support for their cause by encouraging them to set fire to public buildings. On the night of the gig, the audience pelted the group with fruit, eggs and paint and shouted out that the band should be renamed the Mothers Of Reaction. Naturally enough, the band were deemed to be in an unsafe environment and the show ended early. As a result of the experience Frank presented everyone in the band with a Berlin Survival Award 1968 medal, and also wrote “Holiday In Berlin”, later to appear on the “Burnt Weeny Sandwich” album. Frank Zappa had a relatively short life but a long career. He left a large body of work due to the fact that he hardly ever stopped composing, recording, playing and gigging. While there is much footage of Zappa available, the early stage of his career is more sparsely documented than most. 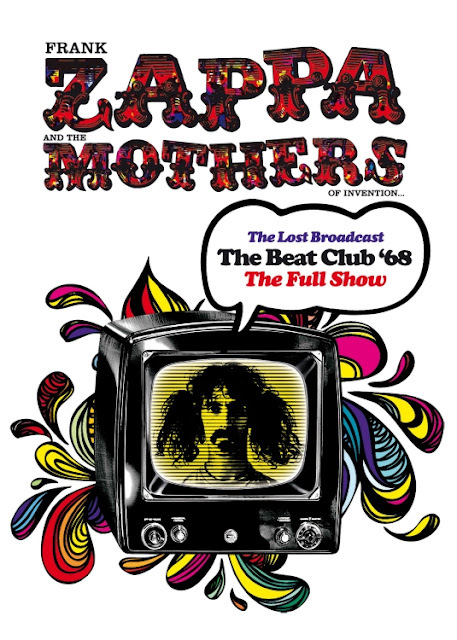 Frank Zappa and the Mothers of Invention - The Lost Broadcast: The Beat Club '68 (Full Show) (DVD) will be released on Dec 5, 2015. The day after what would have been George Harrison’s 73rd birthday, February 26, 2016, Hot Records Ltd. and Vagrant Records are proud to present George Fest: A Night To Celebrate The Music Of George Harrison. Recorded and filmed on September 28, 2014 at the The Fonda Theater in Los Angeles. This live tribute will be available in 4 configurations including 2xCD/DVD, 2xCD/Blu-Ray, 3xLP (180 gram) and digital download. The line up includes Brian Wilson, Nora Jones, The Killers’ Brandon Flowers, Conan O’Brien, The Flaming Lips,Ben Harper, Britt Daniel from Spoon, Heart’s Ann Wilson, Dhani Harrison, “Weird Al” Yankovic, The Strokes’ Nick Valensi, Perry Farrell and many others. On top of the concert footage the DVD has interviews with the musicians backstage and at rehearsals talking about George Harrison’s influence on their art. Camarillo, CA – Marshall Blonstein's Audio Fidelity will be releasing the ultimate “best of” collection by folk legend Judy Collins on Quad 4.0 Hybrid SACD. Colors of the day - The Best of Judy Collins first arrived in record stores in 1972. The recording features Collins' earliest, most time-honored recordings. The song that propelled the album sales was her number one hit, “Both Sides Now,” an alluring Joni Mitchell tune that dominated the charts for months. Collins' voice is remarkably beautiful, her phrasing, her ability to enunciate and her vocal range place her in a category by herself. Her amazing talent is on full display in this excellent collection that includes Collins' explorations into folk-pop, country-pop (“Someday Soon,” an Ian Tyson classic), British folk (“Sunny Goodge Street,” The Beatles “In My Life”), and gospel (“Amazing Grace”) that clearly show her eclecticism. Not sure if you have seen and listened to this beautiful rendition of the 1-Hit Wonder song by Marmalade? My question is how do we get this to be played on our IPOD's? Any help would be great! Dean Ford should go out and tour with Barry Gibb. Listen to the tone and texture of his voice ... he could sing ALL of the Robin parts ... they'd sound FANTASTIC together. And then slip in some of Marmalade's hits, too. (They were much bigger in England than they were here, where this was pretty much their only recognized hit.) What an incredible sound these two could make together. (Just cut me in for 10%!!!) Thanks for sending, Bob ... I love it! It takes you step by step through the process of how to turn a YouTube video into an MP3. Rubber Soul: Happy 50th Anniversary!